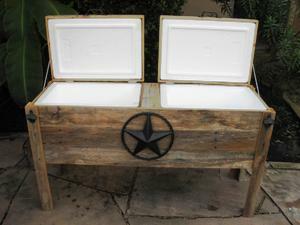 This ice chest is shown here with a Black Star on the front, one each black barn door handle for each cooler compartment, two bottle openers and two pair of black horseshoes. You may also choose from the adornments below according to your budget and taste. Inside is a 1 1/2" thick styrofoam enclosure, which fits in the lid and box perfectly for a tight, cold-enclosing fit. WE do NOT use a non-insulated metal liner. We tried ours out and after THREE days there was still ice inside the box! Also included is a drain in the center bottom to make it easier to let the high-temperature (melted) ice free!